One part of this story is more surprising than the other. 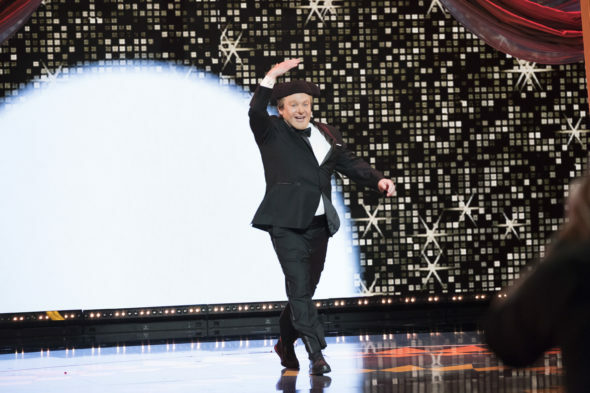 Despite unimpressive ratings, that made it a middle-of-the-pack summer performer, ABC has renewed The Gong Show for a second season. In a shocker to pretty much no one, Mike Myers has also confirmed that he portrays The Gong Show host, Tommy Maitland. The Gong Show, season two, will debut on a date TBA in 2018. An unscripted ABC TV series, The Gong Show is a wacky amateur talent competition, hosted by “British comedic legend Tommy Maitland” (Myers). Celebrity judges in the first season included Will Arnett, Ken Jeong, Zach Galifianakis, Alison Brie, Andy Samberg, Elizabeth Banks, Joel McHale, Dana Carvey, Will Forte, Jack Black, and Anthony Anderson. The first season of The Gong Show averaged a 0.70 rating in the 18-49 demographic and 2.87 million viewers. It ranked seventh and eighth, respectively, out of the 13 ABC TV shows we tracked during the summer of 2017. Learn more from this ABC press release. ABC RENEWS ‘THE GONG SHOW’ FOR A SECOND SEASON! ABC has announced that it won’t be gonging its popular summer series “The Gong Show” and has renewed it for a second season. Celebrated film and television actor/comedian Mike Myers has finally confirmed the rumor that he is, indeed, the show’s host – British comedic legend Tommy Maitland. “The Gong Show,” which is executive produced by actor/comedian Will Arnett, will go into production later this year, and an airdate will be announced at a future date. Last summer, the iconic and irreverent talent show competition made its way into the 21st century with a bang, celebrating unusually talented and unique performers on a primetime stage for 10 episodes. A revolving panel of judges featuring Hollywood’s biggest stars, often including Will Arnett, praised, critiqued and gonged contestants in this revival of one of TV’s all-time great variety shows. Most performers went home with their unique talent that only a mother can love, but the winning act with the highest judges’ score received “The Gong Show” trophy and a check. “The Gong Show” is produced by Den of Thieves, Electric Avenue Productions and Principato Young Entertainment in association with Sony Pictures Television and is taped in front of a live audience. “The Gong Show” is executive produced by Will Arnett, Peter Principato, Marc Forman, Jesse Ignjatovic, Evan Prager, Mike Myers, Jason Weinberg and Conrad Green. Jared Morell, Jordan Barrow, David Bohnert and Chris Choun are co-executive producers. What do you think? Did you watch the first season of The Gong Show TV series reboot? Do you think you’ll check out season two on ABC, this summer? Sound off, in the comments. Great Show! Can’t wait for it to return. It gives you something more than all the garbage about politics, lies, sexual harassment, and murder. Truly an uplifting show. So glad it’s being renewed! My whole family watches, we love it : ). Love this show! Mike Myers is perfect. Guest judges need to be enthusiastic and have fun. Some were bored, boring. Currently re-watching season 1 on ABC.com. Please post info on how to be an audience member. Love you, keep it up, Will. I think it is a stupid show. do not watch. I’m glad it’s being renewed. Better than a lot of shows. I love love love the show. Very entertaining and funny show! The host is great and this show should definitely be brought back. SOOOOOOO DELIGHTED GONG SHOW RENEWED!!!! One of the best shows ever aired. First version great, this version FIRST RATE. Mike Myers and producers deserve emmies. Fabulous band. All the stars absolutely perfect. How lucky we are to have Myers and Arnett in our lifetime.Laughter is healing. And the acts mind boggling. Cannot wait for return.